Deb's Cup of Tea: Another reason I live here. We've had a spate of days that make me love where I live. Fall is fast approaching and these kinds of days, where the highs are in the mid to upper 70's or low 80's and the nights are in the mid to upper 50's or low 60's, are glorious. I've been fortunate to have to be out and about. 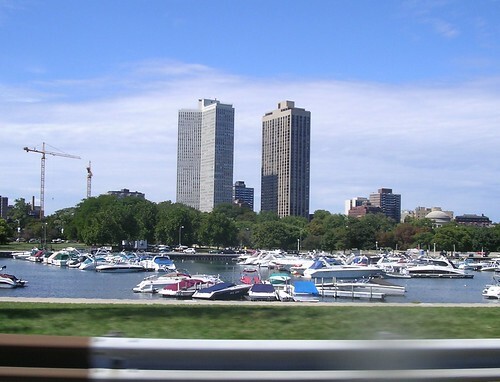 My route on Thursday took me north and south on Lake Shore Drive in Chicago. The day was perfect with puffy clouds, a light breeze and warm temperatures. If I hadn't had so much to do, I might have considered playing hooky for an hour and just sitting by the lake. In all the frenzy over how we came to be, how life originated, I think there is some credence to life beginning in the oceans and then coming onto land. Although there are a lot of cities and towns that spring up in an area which is a natural crossroads, I grew up near one such place, I think people gravitate to areas where there is water. It's not just that there is a convenient source of drinking water, but I think there is an affinity that's in our genes to be in the presence of water. I think we're attracted to it. We live next to water. We live on water. We play in it. We derive food from it. I sometimes think about moving away, getting away from the hub-bub that is metropolitan life. I've remarked before about considering retiring next to the Mississippi River. There is an example of wanting to be near water. In spite of the potential for flooding, we park ourselves next to running water. It's soothing and, in the case of Lake Michigan, ever changing in view. If I lived closer to the lake I probably would, like so many others, spend more time just being by it. I love to watch sunrises over the lake. Watching the lights of the city come on is just magical as you stand on the deck of one of the boats that offer cruises of the lake. I remember sunrises and sunsets along the Mississippi and the few times I've gone to the ocean, watching either the sunrise or the sunset over the ocean has been a highlight of the trip. Yes, there is something about water that draws me in.